presenting a mandatory in-service to clinicians at the end of a busy summer Friday? Having your education to patients or community members fall flat? How can you grab your learners’ attention, maintain it, and be sure they learned what you wanted them to learn? Teaching and learning are skills, and like other physical therapy skills, they must be learned and perfected. 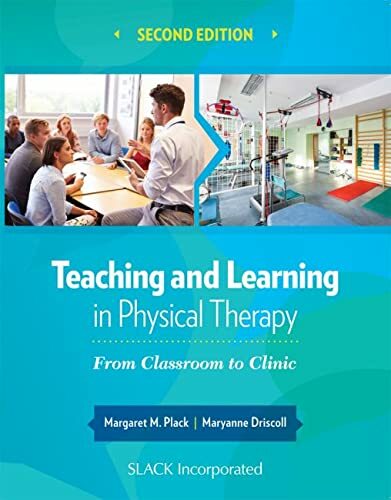 Teaching and Learning in Physical Therapy: From Classroom to Clinic offers a systematic approach to designing, implementing, and evaluating effective teaching-learning experiences. Each chapter begins with Objectives thatclearly delineate what you will be prepared to do after completing the chapter and concludes with a Summary of the major concepts presented. Stop and Reflect sections allow you to actively engage with the content as you process the information and move through the chapters. Critical Thinking Clinical Scenarios provide multiple opportunities for you to apply and adapt key concepts to real world situations. Finally, concepts are reinforced through frequent Key Points to Remember sections. Drs. Margaret Plack and Maryanne Driscoll have over 35 years of experience in teaching, research, and clinical practice. Teaching and Learning in Physical Therapy is grounded in current literature and has a theoretical basis in reflective practice, active learning strategies, and brain compatible instruction. Also included in this text are practical strategies that allow students, educators, and clinicians, working with both students and patients, to enhance their critical thinking and clinical decision-making processes in a variety of settings and situations. Features included:· A user-friendly approach integrating theory and practical application throughout· References at the end of each chapter· Classroom and clinical vignettes to reinforce concepts· Integrative problem-solving activities and reflective questions· Ancillary instructors’ material for faculty membersIn physical therapy, teaching and learning are lifelong processes. Whether you are a student, clinician, first time presenter, or experienced faculty member, you will find this text useful for enhancing your skills both as a learner and as an educator in physical therapy. Margaret M. Plack, PT, EdD, is an associate professor and Interim Senior Associate Dean for the Health Sciences Programs at The George Washington University, Washington, DC. Dr. Plack received her EdD in adult education from the AEGIS Program in the Department of Organization and Leadership at Teachers College, Columbia University, New York. Along with Dr. Driscoll, she has coauthored and taught a graduate course titled "Teaching in Physical Therapy Practice" in several academic institutions. She has also implemented the strategies to be discussed in this text in a number of teaching and learning venues including the American Physical Therapy Association’s Combined Sections Meetings and Annual Conference and various other conferences on medical education. She has been involved in ongoing research related to adult learning principles, reflective practice, and educational outcomes and has published several manuscripts on topics related to this text. Dr. Plack has twice received the Stanford Award from the Journal of Physical Therapy Education for her writing. Maryanne Driscoll, PhD, is an educational psychologist and associate professor in the Doctor of Physical Therapy Program at Touro College in New York. Dr. Driscoll received her PhD in educational psychology from Columbia University, New York. Dr. Driscoll consults with schools and hospitals throughout the metropolitan New York region on effective instruction. 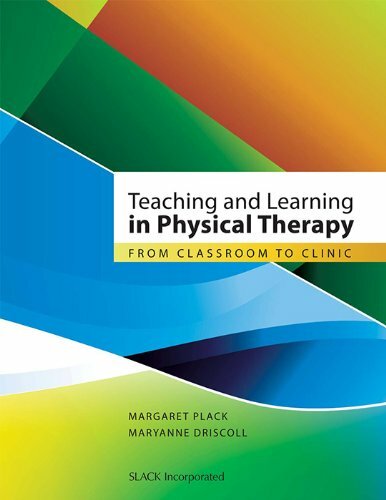 With Dr. Plack, she coauthored and taught a graduate course titled "Teaching in Physical Therapy Practice" for 2 post-professional DPT programs, and she teaches similar content in 2 professional DPT programs. She has also implemented the strategies to be used in this text in a number of teaching and learning venues including the American Physical Therapy Association’s Combined Sections Meetings and Annual Conference and various other conferences on medical education. Dr. Driscoll has been involved in ongoing research related to adult learning principles and educational outcomes and has published several manuscripts on topics related to this text. "Teaching and Learning in Physical Therapy is an excellent resource for the health professional that models evidence-based principles by being grounded in strong theoretical and evidence-based approaches to teaching and adult learning within the context of health care."